Submitted by mahoney on Thu, 07/03/2008 - 11:46am. Party City USA Including Hawaii...Party City is the largest retail party supply store in the United States and Puerto Rico, with more than 500 locations. It was founded in 1986 in East Hanover, New Jersey as a one-stop party supply store that would take the hassle out of party planning. 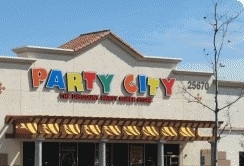 Headquartered in Rockaway, New Jersey, Party City, Party City sells decorations, wrapping paper, helium balloons, plastic eating utensils, paper plates, party music CDs, little toys, candy, etc., themed for birthday parties, weddings, baby showers, graduation, communion, conformation, christenings and holidays. Some stores sell Halloween costumes year round. All locations were verified and checked against the website locator. Locations not shown on the locator were deleted. Gps visualizer was used to determine the coordinates for the new locations. If I missed any locations, please send them to me. Added a new location in Canton,GA and corrected the location in Alpharetta,GA. Updated the file. Net increase of 19 locations. Updated the file. Net increase of 75 locations. Updated the file. Net increase of 142 locations. Updated from the latest website listing. Net increase of 92 locations.